The other day I was just strolling in the downtown Athens market area and decided to pass from the only pen shop we have here, to take a look at the new pens and inks. In a very prominent place, I saw the new Visconti Rembrandt pen, in a wonderful purple color, that was accompanied by a bottle of Visconti ink in the same color as the pen . Being a lover of dark purple inks, I convinced the owner to sell me the only other bottle he had (the ink had no box) for the fair amount of 9 Euros, and here are my first impressions. 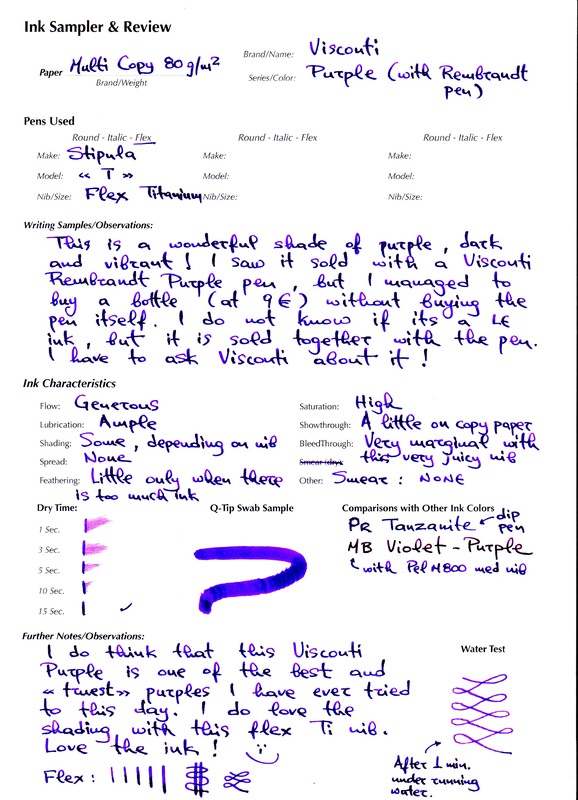 I think that its a nice purple ink, very vibrant and resistant to water (see the water test). I do not know if its an ink made only for the purple Rembrandt pens, but nevertheless I liked it a lot. Wow, that shading is incredible! I hope it becomes available without the pen! For Behind the Scenes pictures and comments, check out Instagram & Twitter. Great Shading and I really like the color, but it seems a bit slow to dry??? Edited by WOBentley, 26 November 2011 - 01:16. Very nice ink... I like the glow of the purple colour in the shading. Wow, that's a gorgeous colour. I have no place to use a purple ink but I'd buy that one! Wow! This purple just POPS UP on my monitor! Edited: Is this ink really so luminous on the paper like it is on monitor? Edited by fabrimedeiros, 26 November 2011 - 21:19. Oh yes, it is! That is what blew my mind away! Edited by Korybas, 26 November 2011 - 22:21. What a gorgeous purple! I hope it becomes available. Many thanks for introducing us to this fantastic ink! The ink seems to be another treat from Visconti, and the vibrancy seems to have much in common with their Blue ink. The shading is quite a surprise, especially on such paper; and as you mention may be attributable to the Ti nib. But even without such a nib, the ink has the potential to deliver shading - it just needs to be encouraged. The water resistance is also welcome. I'm not a huge fan of Purple in general, but this could start something interesting . . .
That is a gorgeous colour. I have been looking for purples and this may be what I have been seeking. Now I just have to find a bottle to try myself. Blimey, that hasn't half got some pop to it. I really hope they either start selling that on its own or some pops up on the bay. Maybe if someone talks to someone who is an AD or directly they will make a limited run for us. Just a thought. Thanks for the lovely review. I've been looking for the perfect purple and this one has certainly caught my attention. I do hope it's available without the pen. Call me crazy, but doesn't this sorta resemble the Diamine Bilberry (at least from the samples posted in the New Colors thread)? The ink enables the pen purchase, no? Expensive ink, but they sweeten the deal by including a nice pen. Edited by Sandy1, 28 November 2011 - 09:34. I have an update concerning this gorgeous Visconti purple ink. I have contacted Visconti about it and they sent an e-mail back to me today saying that they plan to launch this ink on January 2012. So, thank the Pen God, its not a LE ink and it will not be sold only with the Rembrandt FP.